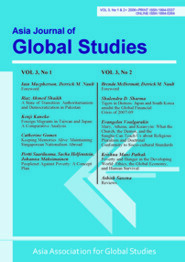 The Asia Journal of Global Studies (AJGS) is the official journal of the Japan-based Asia Association for Global Studies (AAGS). The journal features research articles on Asia and other world regions from an Asian regional perspective. AJGS' other regular offerings include guest columns by global studies experts in Asia, reader commentaries, and book reviews.